Rich, hearty, and cheesy, this dish will warm you up when it’s cold outside! Insert the cut corner into the manicotti and squeeze the bag to pipe the mixture into the shell. Be careful you don’t overfill it or it may split. Place the stuffed shells in the baking dish. 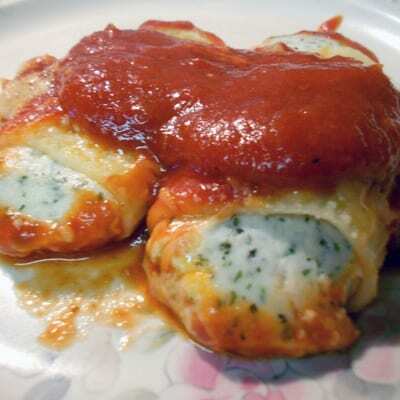 Pour the rest of the sauce over the shells and sprinkle with the last 1/4 of the mozzarella cheese. Bake in a 350 F oven for about 30 minutes or until heated through and bubbly. This is really simple to make. You can even assemble the dish ahead of time and put in the oven when you get home from work. Just let it come to room temp while the oven is preheating. You’ll need to add about 10 minutes or so to the cooking time if you bake it cold.